As far as keyword data goes, September 23, 2013 may be remembered as "The Day Google Stood Still." In late 2011 when Google began encrypting keyword data for all searches by users who were logged into their Google account, many SEO analysts and webmasters feared it was the beginning of the end. Today, it seems the end is here. For years, webmasters and SEO professionals have used keyword data to track the effectiveness of SEO campaigns based upon specific keywords and keyword phrases. Being able to see what search term your visitors use to reach your site is an extremely helpful marketing research tool. Take a hypothetical carpet cleaning company, for instance. Previously, they could look at their Google analytics and know that 30% of their visitors found their site with the search phrase "how to remove pet stains." If only 3% of their visitors reached them by typing in "professional carpet cleaning," they knew exactly where to concentrate on new content and who their target customer was. This information is now gone or at least deeply hidden. All traffic originating from Google searches now displays "encrypted search" or "not provided." "To publish any intention of Google's motives for this move would be pure speculation. Not wanting to feed the rumor mill or feed any false speculation, Search Engine Watch has reached out to members of Google's Global Communications team and tweeted Google's Distinguished Engineer Matt Cutts for possible comments from the Engineering Team. We've yet to receive an official comment." It's too early to tell how this will ultimately effect webmasters and SEO pros. 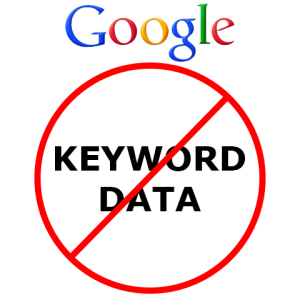 It's definitely going to change the way we track keyword performance. Other leading search providers such as Bing and Yahoo haven't followed Google's lead ... yet. It's possible that they never will. But when the search leader (and there's no arguing that Google is that, with 65.2% of all web searches) starts a trend, would it be surprising if everyone else didn't follow along?